China's top political advisor Wang Yang has called for comprehensive and precise implementation of the religious policy of the Communist Party of China (CPC). Wang, a member of the Standing Committee of the Political Bureau of the CPC Central Committee and chairman of the National Committee of the Chinese People's Political Consultative Conference (CPPCC), made the remarks during a research tour to Jiangsu Province in east China. The two-day tour ended on Thursday. 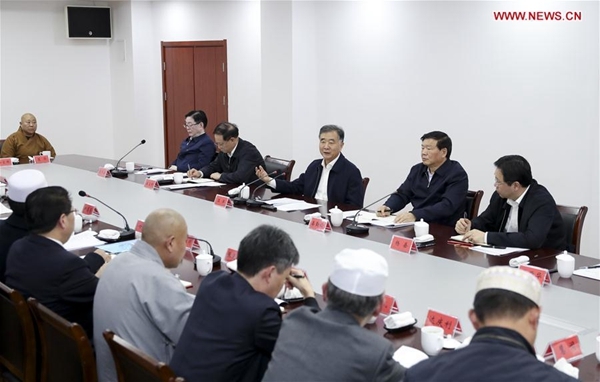 The work on religious affairs affects social harmony, ethnic unity and national security, said Wang, calling on CPC committees at various levels to strengthen the Party's leadership over the work. "Commercial capital should be strictly forbidden from getting involved with religious affairs," stressed Wang. He called on various religions to interpret their teachings and tenets in line with the requirements of the development and progress of contemporary China and fine traditional Chinese culture, to better adapt to the Chinese context. During the tour, Wang also held a symposium on the work of the CPPCC National Committee and visited enterprises with investments from Taiwan.